color lustre dry cleaner dry shampoo is rated 3.0 out of 5 by 5. Don't just wash your hair, dry clean it. Just as the finest fabrics require the most delicate cleansing to preserve color and touch, hair requires superior care to maintain pristine condition. This 2-in-1 dry shampoo gently cleanses by absorbing oils and impurities at the roots while moisturizing dry lengths and ends. Unlike other dry shampoos, the formula is water-free and contains translucent micro-fine powders that absorb oil without leaving any residue or unwanted texture behind. Hair color is revitalized. 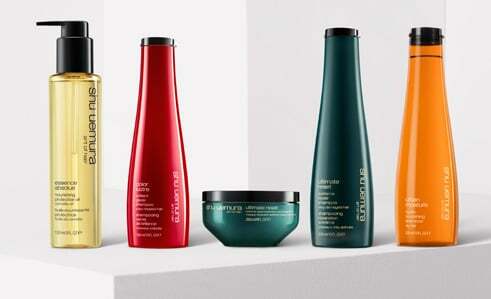 The result is weightless bounce, shine and salon fresh feel. Great for second day hairstyles, post-gym touch ups and work week refreshes. create a part on dry hair. spray dry shampoo 8-10 inches from roots. Repeat gesture on multiple sections as desired. brush or use fingers to distribute product evenly. The Musk Rose tree originated in Asia. In the 16th century, after spreading throughout Europe, it was introduced to south America. Today it is mainly found growing in Chile. Oil is extracted from the seeds of the Musk Rose for its inherent healing properties. Goji Berries are renowned in Asia as the most concentrated natural source of anti-oxidants. They are so delicate that they must be harvested carefully by shaking them free from the trees so as not to crush them. Goji Berry Extract helps protect the hair from oxidation and color fade. Aqua/Water ● Va/Crotonates/Vinyl Neodecanoate Copolymer ● Isopropyl Myristate ● Hydrogenated Starch Hydrolysate ● Stearyl Alcohol ● Isoceteth-20 ● Candelilla Cera/Candelilla Wax ● Propylene Glycol ● Stearic Acid ● Octylacrylamide/Acrylates/Butylaminoethyl Methacrylate Copolymer ● Palmitic Acid ● Triethanolamine ● Oleth-30 ● Butylene Glycol ● Bis-Diglyceryl Polyacyladipate-2 ● Paraffin ● Alcohol Denat.● Cera Microcristallina/Microcrystalline Wax ● Parfum/Fragrance ● Aminomethyl Propanol ● Phenoxyethanol ● Cera Alba/Beeswax ● Synthetic Wax ● Glyceryl Stearate ● Caprylyl Glycol ● Carbomer ● Myristic Acid ● Limonene ● Benzyl Benzoate ● Alpha-Isomethyl Ionone ● Linalool ● Hexyl Cinnamal ● Citral ● Cryptomeria Japonica Bud Extract ● Benzyl Alcohol ● Citronellol ● Geraniol. Rated 1 out of 5 by Kelly from Awful 1. Smells terrible. I was particularly surprised at this considering every other shu product I use smells amazing. 2. The aerosol runs out long before the product is gone. I still have at least 1/3 of a can that I cannot use due to this. 3. Does a so so job. For me the texture wave or the volume maker are more effective in creating a clean hair look. I definitely will not buy again and do not recommend. Rated 5 out of 5 by pnichols from Best Dry Shampoo! I have used many different dry shampoos. Shu Uemura Color Lustre Dry Cleaner is by far the best ever. It applies cleanly, with no residue. It has a clean and fresh fragrance. When I use Color Lustre Dry Cleaner, my hair looks clean for another day or two, and the bottle lasts a long time. Rated 4 out of 5 by StaJo from Best Dry Shampoo, but... I have tried many different dry shampoos on my oily hair (I struggle to go 2 days without washing my hair, it gets oily quick) and this is by far my favorite. I love that it doesn't have a heavy scent to it, in fact no scent at all. Unlike other dry shampoos when I use it I don't feel the product on my hair, it actually feels more clean. The only problem I do have with this product is the packaging. I've had 2 bottles of it now and with both of them once it got towards the end of the product it stopped spraying. The nozzle was not clogged and I could shake it and feel product inside, but it would not spray out like it did when i first got it. For the price they really need better packaging that allows you to use all the product. Rated 4 out of 5 by ShuFan from Can't go without it! I bought this product about 6 months ago, and haven't been able to go without it since. After I spray it on, I quickly blow dry with a brush, and my hair looks and smells wonderful. I'd recommend the product.